This year has been one of highs and lows. 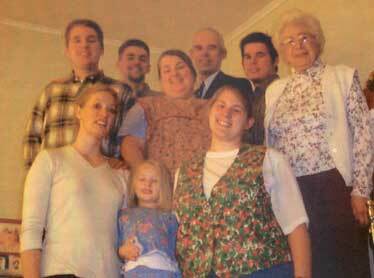 The lowest low was as we sorrowfully watched Grandpa John William Crossett slowly deteriorate in health. He finally was released from his trials on May 9. Janus and Christopher flew out from Utah to speak at Grandpa’s funeral, which was a blessing to all those who attended. In the winter Christopher began his working career as an accountant for Hertz Sales Division in Ogden, Utah. He enjoys the work and has already begun buying and selling cars: He moved Grandpa Crossett’s beautiful brown 1985 Thunderbird to drive from Logan to Ogden every day to a beautiful white 1995 Toyota Camry to a 1995 Jeep Cherokee to a 1997 Jeep Cherokee – having gained much wisdom in car trading world. Janus finished school in April and continued to work full-time at Auto-Soft as assistant facilities manager, work he enjoyed doing. During the summer he made the short list for job at the Kirtland (Ohio) Restoration Project, but then did not get it. In September a job came available at the Joseph Smith Birthplace Memorial in Sharon, VT. Janus applied for it, got it and moved his family here all in about two weeks’ time. He, Laura and Grace moved in with us on October 7th. In early November, Janus continued demolition work on the interior of the south end of the Riverbow house. Living quarters are rather cramped on Cranberry Hill, but it is a real joy to have Janus, Laura and dear little Grace here in our home. One can never get enough baby hugs and kisses and Grace is willing to indulge her grandmother continually! She is such a smart little girl that she frequently amazes her family with her insights and understanding of all kinds of things. After ending his responsibilities as the computer guru, Bob hiked the entire Long Trail from North Adams, Massachusetts to the Canadian border – 270 miles, 27 days of hiking, and three days off for rest and to take care of his High Council responsibilities. He came home confirmed in the necessity of simplifying our lives. On the final day on the trail Bob’s mother, Megan, and Pattie drove north where Megan hiked the last 5 miles with Bob (Doc) and Roger (Rainman) his hiking companion for the last week. At the end of the hike Bob wrote up his trail journal and put it and photos of the trip on the Web http://photos.yahoo.com/robert_j_crossett . In August and September, Bob helped in preparing the Boston temple for the open house and dedication, and presently is a worker there on Friday evenings and Saturday morning and afternoon. Robbie spent the summer working at Dartmouth College in Residential Life cleaning rooms again. One benefit of that job is that he gets to bring home lots of great “stuff” (clothes, books, tennis rackets, etc) that Dartmouth graduates just leave behind. In late summer and into the fall he helped move thousands of books from the Baker Library to the new Berry Library, after a short time becoming the floor manager. He spent every penny on new computer equipment�a Mac iBook, which he then sold to an Oregonian lady for her son’s Christmas gift! Pattie continued to spend the year struggling with ill-health but during good spells she has done genealogy for our family and others, and for hire, earning enough to purchase a new computer for this important work. Her next plan is to get a notebook computer so she can go to town clerk offices and historical societies and type in genealogical information to upload to the Web for the many people who do this work. Megan came home from her mission in Venezuela just before Christmas last year and got a job as a educational assistant at the Ray School in Hanover, NH and supplemented that job by working as a census enumerator. She has spent a happy fall at Utah State and is very excited about the work she is preparing to pursue as a Family and Consumer Science teacher. Jonathan continues to serve in the Belgium Brussels mission and in the late summer he was called into the Mission office to serve as the tech-y missionary: handling the phone cards, the car fleet and other computer functions. He loves the work and is thrilled to be teaching the gospel in the evenings after the office work is done. He will return home on March 16 and we are so excited to see him. We are also barely hanging on until Christmas Day when we will get to talk with him on the telephone. Well, that is a flavor of the year past. We hope all is well with you and yours and that holiday season and all the days to come with be filled with peace, harmony and prosperity.